CINtactics is an ongoing series that decodes linguistic forms and tactics in cinema with a contemporary international focus. 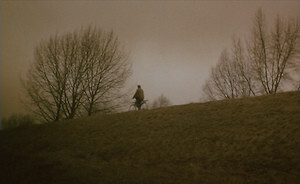 The visual approach in most of cinema is that of photographic realism, meaning that aspects of focus, depth, contrast, and perspective – even if the content is fantastical or computer generated – remain rooted in the ways in which we see normally (movement of the camera aside). That is to say the manner in which deep and narrow focus, close and wide compositions, and the solidity of the filmed image derive from the behavior of the human eye . When a filmmaker chooses to affect the photographic regularity of an image, whether through filters, blurs (vignetting, rack), cropping, etc the result is a fundamental change in the delivery of the information. Intuitively approached, the manipulation of the photographic schema of a film can enhance visual material in the same way that exaggerating or modulating our speech affects our meaning. Consider too the violinist who bends their string to negotiate the distance between notes rather than playing one and then the other in sequence. Suffice it to say, as CINtactics aims to divulge in each of its explorations, the way in which we are shown something is inseparable from what we are being shown. 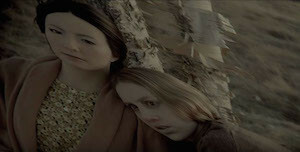 Take for example Keislowski’s A Short Film About Killing, where the coloration of the film is made into a nauseous mix of dour greens, ambers, and grey’s and where the composition of the frame is persistently isolated to one side or another by an imposing shadowy vignetting. Through this notable obscuring of the photographic “purity”, we apprehend the internal sickness of the protagonist, the dourness of the city and its outskirts, as well as the disturbed morality of the criminal justice system of then Poland. Director Koji Fukada (whose Cannes winning Harmonium just received a US distributor) brought this notion acutely to my attention with something he does late in 2015’s Sayonara. Like his previous work Au Revoir L’ete, Fukada favors the isolated town, the isolated person, the isolated heart, and a languid sense of times passage with peripheral nods to larger social events. In the affectingly bleak Sayonara (a premiere at the 2016 Japan Cuts Film Festival at NY’s Japan Society), which has stark and poetic reminiscences to Keislowski (exemplified in these likened images of lone bicyclists in respective films), Japan has suffered an unparalleled nuclear disaster with reactors all over the country in coordinated meltdown. Its citizens are being evacuated slowly through a lottery system. There are hints at the disproportionality of this system, but day after day, people vanish to other lands, and systems and customs within the country like internet, mail, festivals devolve and discontinue. Sayonara isn’t about the disaster at hand. It isn’t about the ravages or rampage of a lawless society on the brink. It is about the dismally calm dissolution of lives and ways of life, and about the implosion of individuals who are left only with themsleves and their histories. The center of Sayonara is Tanya (played by multilingual Bryerly Long), a refugee herself from South Africa. She has lived in Japan since she was 10, with Japanese as her primary language. Tanya is frail, she moves slowly, exhibiting the increased effects of radiation sickness. Seemingly abandoned by her parents, she dwells in a rural home amidst dry swaying fields of grass and pines in pale amber-tinged light with her wheelchair-bound Android companion Leona (played by actual android Germinoid F developed in part for theatrical stage performance). This understated relationship becomes the film’s most profound, in part for what it represents of the gradually closing human-robot divide, but largely for the content that passes between them. I would put forward that perhaps the most Japanese quality of this film isn’t the location or the language, but its very treatment of the existence of an Android, which is to say it exists without being the topic, without a shred of controversy, without taboo. Leona exists and the existential material is to be found around her, not radiating from her. More than a vessel of information, Leona’s programing evolved its emotional intelligence and aesthetic tastes (such as concepts of beauty) through her interactions with Tanya across years. Tanya’s multilingualism and monotone emulates Leona’s own slight tonal artificiality and expansive capabilities. The two contain one another. One of the questions posed of the film is if in this seeming binary Tanya has, in effect, only herself. None the less, they pass the minutes, hours, days, weeks in quiet, in repose, going about and conversing about the mundane, reciting poetry and dissecting the past. Tanya’s resigned sullenness fills the rooms of her house and expands as those few that she regards leave her company in one way or anther. Tanya remains while the transience of everything seems to happen to her, whilst she watches. The camera behaves much the same, often entirely static, moving only when it serves the moment, attention focused on the intimate scale and not in a manner intended to imply the macro. Tanya’s withering away is the specific gravity of Sayonara. 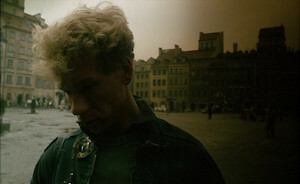 During an isolated 10 minute sequence in the film’s final act, after hopelessness has ballooned to its largest, the image on screen refracts into a left-leaning slant. The color mutes and dims even further. The salience and decisiveness of the technique gives it its potency. Again, the isolation of a technique and its thoughtful application to specific material is a linguistic potential of cinema. At the apex of Sayonara’s deep but quiet despair, when loneliness and the finality of that loneliness reverberates through Tanya, when she comes to question the way she has seen herself throughout life, and the toll of illness has truly gripped her body, the world slants and takes on the tint and timbre of an overcast dream. The trailer itself (see below) features some of this imagery. The landscape feels alien, as if finally expressing the hazard of this time, as well as thrusting Tanya into a state of feeling truly and profoundly foreign. Tanya glacially pushes Leona along a path strided by tall grasses. What looks like a small funeral march passes them by. The two eventually find a place to stop, a weary Tanya rests on Leona’s shoulder. Through poetry, the two begin a conversation about the seeming duality of loneliness and happiness. Are they opposites? Does the presence of one imply the absence of the other? It is important to mention that the word Sayonara does not mean “goodbye” and isn’t used with regularity. It means “farewell”, which is to apply a finality or gravitas to someone’s departure. Sayonara would be said to someone moving to another city, not to someone leaving work for the day. Bearing this in mind, the mood and trajectory of the film begins even with the title.